Your time is precious and it’s always stretched thin, especially on weekdays when you don’t have time to grocery shop. So delivery, takeout or frozen food is the norm, right? But actually there’s tastier and healthier options! Introducing Fresh Canteen, a Toronto-based fast and friendly service that delivers to your door (or to your concierge for most of us condo folks) a set of fresh ingredients and easy-to-follow recipe that allow you to be the star chef at home again. Each meal serves two and prices are calculated at $12.50 per person per meal. Fresh fish or chicken or other produce are packed in freeze packs to maintain freshness. I was able to get home from work late at night, receive the Fresh Canteen package and store in my fridge for a few days until I had a chance to bust out the goodness. All the ingredients were still fresh. Putting the meal together takes about 40 minutes and the meal ends up tasting amazing – even for someone out of experience of not ever having time to cook. I was grateful for the clear step by step instructions. Personally I prefer no added salt or butter so I enjoyed skipping those steps and still having the end result taste amazing! 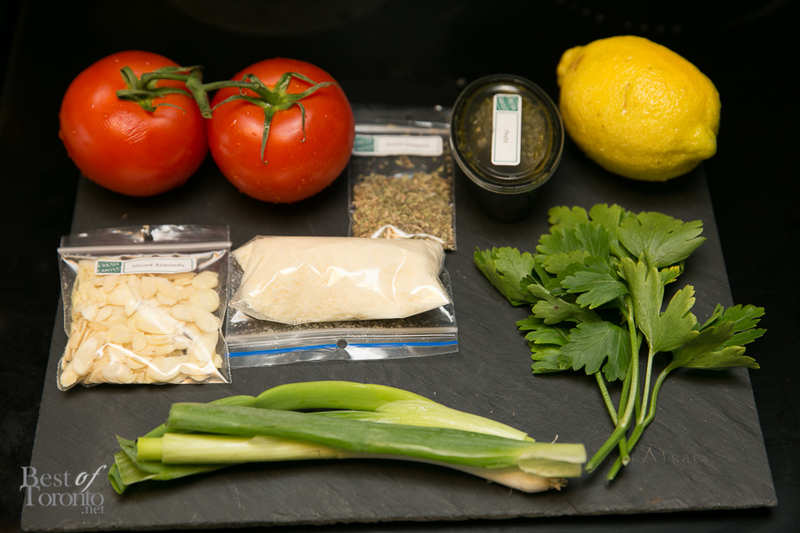 If I can turn these sets of ingredients (sole fish, tomatoes, almonds, parsley, green onion, orzo, pesto, parmesean) into the Sole Almondine dish in the photo above (while burning the roasted almonds), imagine what you could do! Get started by visiting www.freshcanteen.com online and see which fresh meals are available now! Menus change weekly.